In 1995, Catherine Denoual moved to Ho Chi Minh City with her husband and two small children after having lived her whole life in Paris. At the time Vietnam was considered the “Far West of the East”, a country that had only just opened its doors. Catherine quickly realised all the treasures this new place would unveil and she never looked back still living there to this day. In France she had worked as a fashion editor in big publications for 13 years. By relocating she discovered a new passion, interior design. In this new city, the skills of local artisans were inspirational. She was fascinated by the delicate and handmade artistry surrounding her. Embroiderers, silk and rattan weavers, wrought iron workers, silversmiths, mother of pearl carvers and more were some of the most riveting. Inspired to create not only beautiful things for her new home but also to make her own designs, she invited these artisans into her home to work with her. She started by wanting to make lovely homemade sheets with her own embroidery patterns. Catherine loved to work closely with seamstresses and embroiderers to make her designs come to life and little by little it evolved from just doing it for herself to also doing it on a larger scale. It became a true passion. From a small room in her house to a factory employing over 100 people, in 1998, the brand was underway and made its first presentation in Paris at the annual Maison & Objet the largest home deco trade show. For following years, she developed a large global network with retailers embracing and showcasing her new brand. In 2006, Catherine Denoual Maison opened its first stand alone boutique all designed by Catherine. A white space with elegant wall fixtures softly echoing French heritage, the aim to create a calm oasis where the products are the only colours in the limelight. To this day all the stores are a variation of this original store design and are all personally designed by Catherine. Today the Catherine Denoual Maison Flagship store is in downtown Ho Chi Minh City showcasing all of her handmade embroidered bed linen and table linen alongside a multitude of home décor items. In her stores you will find duvet covers, sheet sets, candles, home fragrance, pyjamas, tableware and all matter of high quality and stylish products for the home. Other shops can also be found in Moscow, Bangkok, LA, Japan and other locations in Vietnam. Catherine Denoual Maison makes home linen of the highest quality using only the finest fabrics and the most skilled artisans. All materials and fabrics are chosen for their luxurious characteristics and this in turn creates a sumptuous, comfortable and durable product. All designs are created by Catherine, each collection holds a colour way that is curated by her and have nuances that are complimentary to allow customers to mix and match her unique pieces. Her inspiration for the embroideries come from traditional embroidery patterns but are revisited and transformed to a contemporary design. 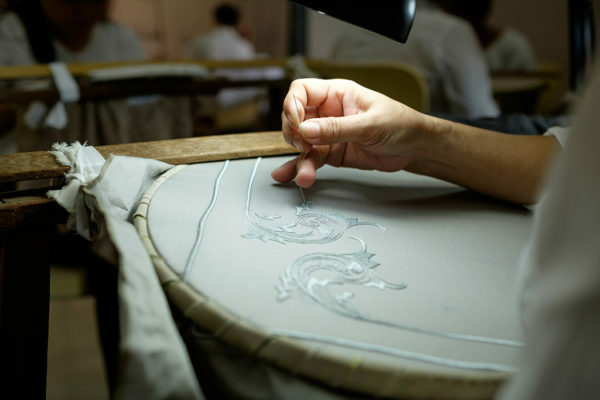 All embroideries are handmade except for parts that do not require human skills but rather require machine precision. The bed linen is produced with 100% Egyptian Cotton yarn and with a satin weave to create a glossy and soft finish. While the table linen and homewear is created from 100% Linen providing an absolute fluidity and robustness and an unbelievable hand feel. Other products are made to accompany these core items into the home. 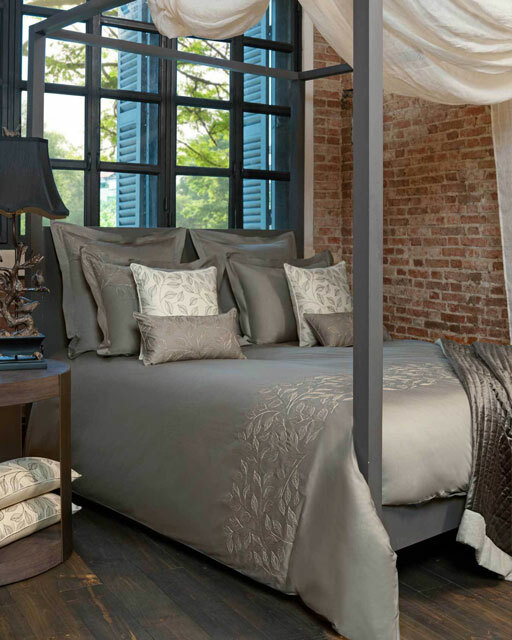 Unique designs and an amazing feel is at the heart of Catherine Denoual Maison, the bed linen truly provides a fabulous sleeping experience. Once you sleep in these sheets you won’t ever be able to look back. Catherine Denoual Maison’s heritage originates from skilled craftsmanship and this value still hold true today and has evolved to create a luxury brand of linen always innovating to provide beautiful and comfortable products for customers.